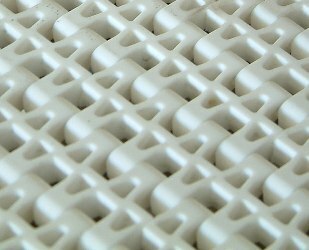 This type of belting is very adaptable and often used in food & pharmaceutical application due to it hygiene quality. It has no tracking problems and can be deigned in a horseshoe shape as bends are easily achieved. Suitable for packaging companies that have previously had issues with cleaning their conveyors at the end of a production process with hose down. If you are looking for a complete system of for handling your products from one process to another and would like to know what your options are for our conveyor belting systems in plastic modular belt please contact us.